Quetzaltenango, better known locally as Xela (Shay la), is Guatemala's 2nd biggest city. It has a population of ~225,000 people and is located in a mountain valley at an elevation of 7,600 feet at its lowest point. 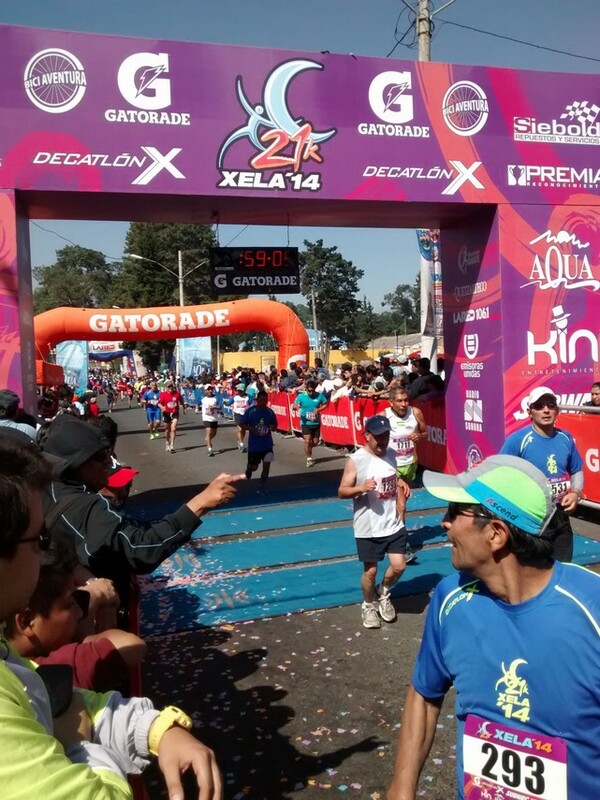 It was also the site of the Xela 21K (aka Half Marathon) this past weekend. Signing up for the race was not easy. The race had a website but it was a year out of date and missing key details (like how to register). Then I found their Facebook page. Luckily it was a little more up to date (but disorganized). It took some time but thanks to the Facebook page I finally deciphered you could register for the race at a sporting goods store in Xela, or at a specific chain of banks. Fortunately we have one of the banks in our town. Registering at the bank required knowing the name the bank had on file, Cause #, and Transaction #. This info was essential and very difficult to find. Armed with it, and Q140 (about $17.50 US) I registered for the race. My receipt for registration was technically a deposit slip. 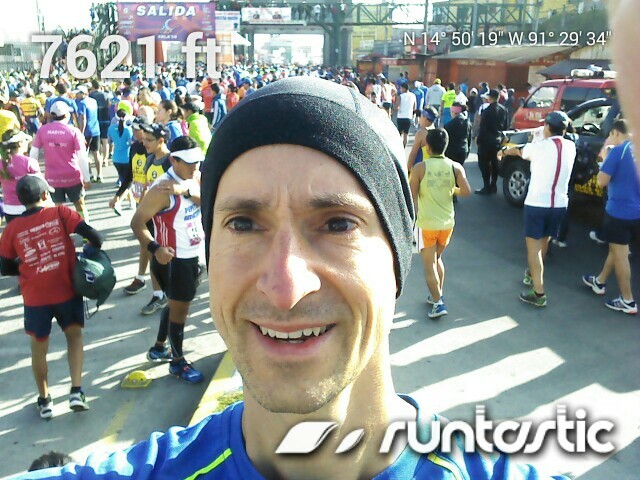 Fast forward a few weeks to the Race Expo, held the day before the race at a mall in Xela. It was very well organized. Volunteers were manning the stations for packet pickup, chip testing and shirt pickup. I gave them my bank receipt and got everything I needed. Tag and I at the expo in front of the race map. RACE DAY - The race began at 8AM about 2.5 miles from our hotel. Mick and the kids were still sleeping which meant I was on my own to get to the start. I started jogging there when I ran into a group of Americans dressed in running garb standing on a corner. They were waiting for the local public transportation called a microbus (think big Toyota vans that act like taxis). It costs Q1.5 (about 19 cents US) to get anywhere in town so long as you are willing to sacrifice your personal space. I waited with them and less than 10 minutes later we were at the start of the race. 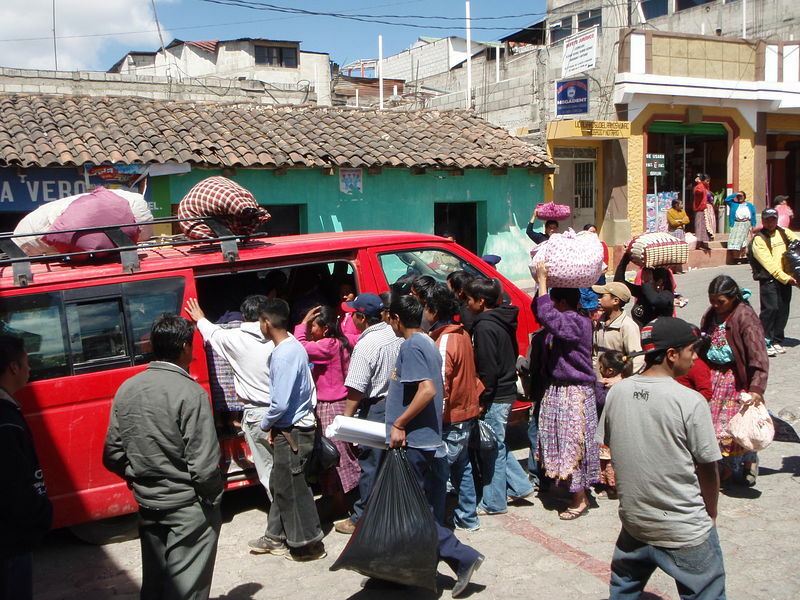 Xela's form of public transportation, the Microbus. Yes, they will all fit. Once I got to the start I checked the elevation on my phone. 7,621 feet. Ouch, I was already breathing heavy. Who runs a Half Marathon at this altitude? Me, about a dozen other expats and a few thousand Guatemalans. Yep, that's what I was expecting but it would get worse. Not only was the race run at altitude but the race director decided it would be fun to throw in a few very ugly hills and push the high point of the course just under 8,000 feet. The course elevation fluctuated between 7,594 feet and 7,966 feet. 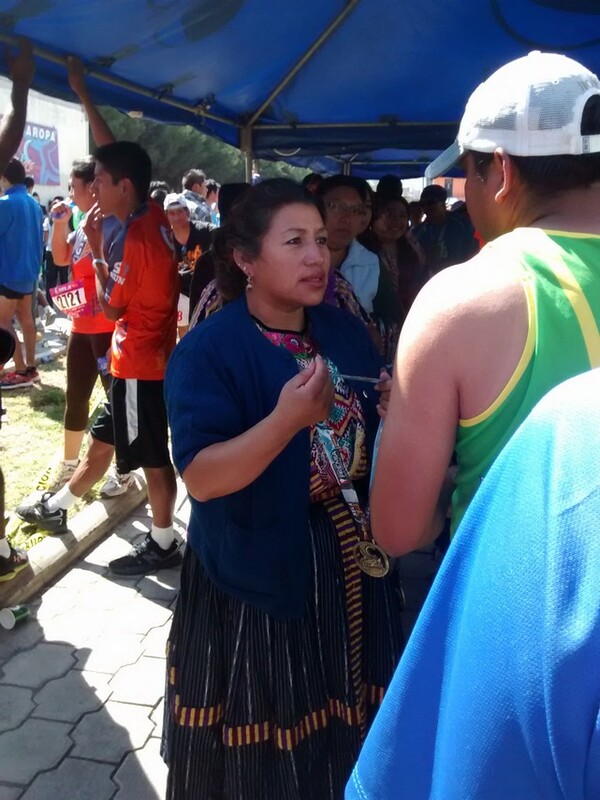 As far as races in Guatemala goes this was a big one. More than 3,000 people registered for the event. Everyone started to come out of the woodwork about 10 til 8. Just before the start there was a singing of the Guatemalan National Anthem, a marimba band and tons of confetti. BANG! The race was off. 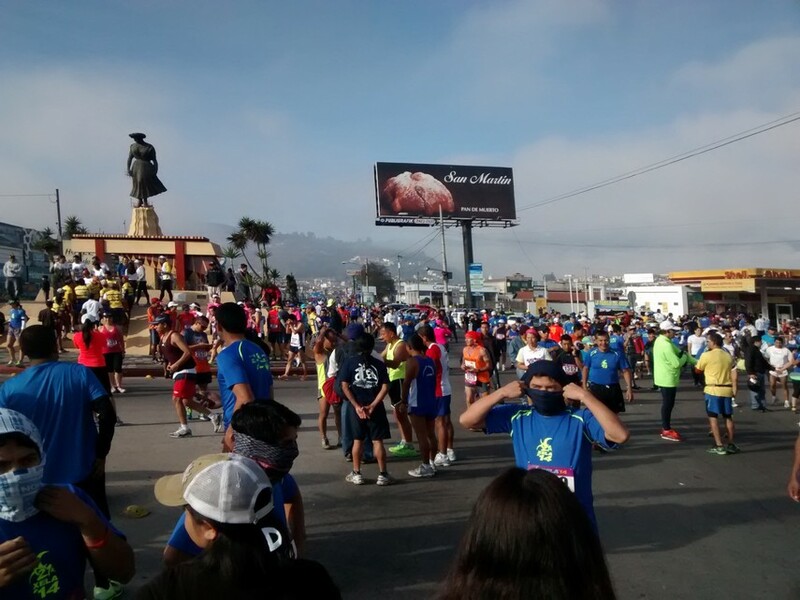 The streets were flooded with people and the course was well marked at each kilometer (KM). Wait a minute, how far is a single KM? What pace is a good KM pace? Thankfully, I did not have to wonder for long. I had my Garmin watch on and it was speaking English, I mean miles. Having concerns about the altitude I started off with a conservative pace of 8 minute miles. This worked well for the first half of the race, then around mile 7 the hills started and never stopped. I was light headed as soon as we hit the first big hill. My brain and legs were not getting the level of O2 they were used to. I had to keep checking myself. Am I okay? My brain said, NO, SLOW DOWN! But I kept scanning myself, I was fine. My brain was just being conservative wondering where the oxygen had gone and was making me suffer. I slowed a bit and kept moving. The finish was well supported and rivaled many US races. Chip timing mats, professional labeled archways and sponsorships adorned the finishers. 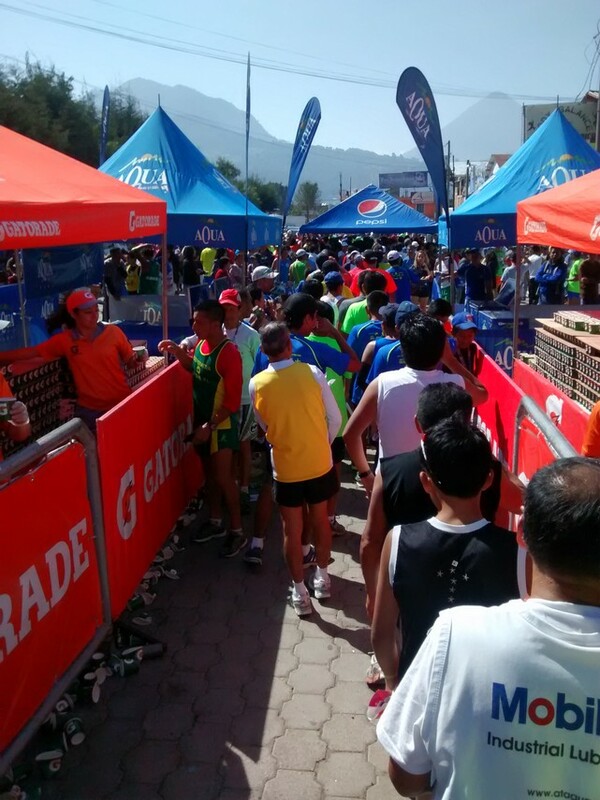 The march of finishers headed towards refreshments. Gatorade a plenty for the finishers. A very unhappy water worker. 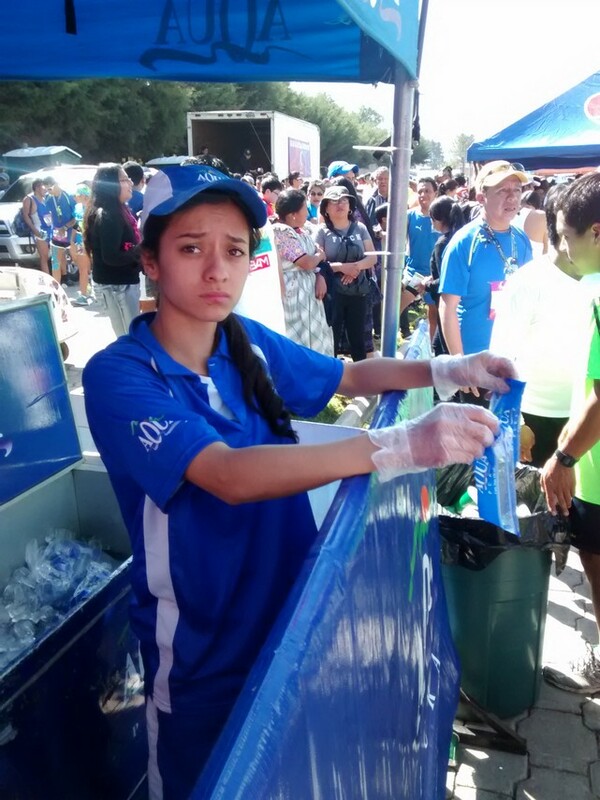 NOTE the water was served in sealed bags along the entire course. This is great for races as it is impossible to spill. Just bite, tear and drink. This is also a common way to buy water throughout the country. 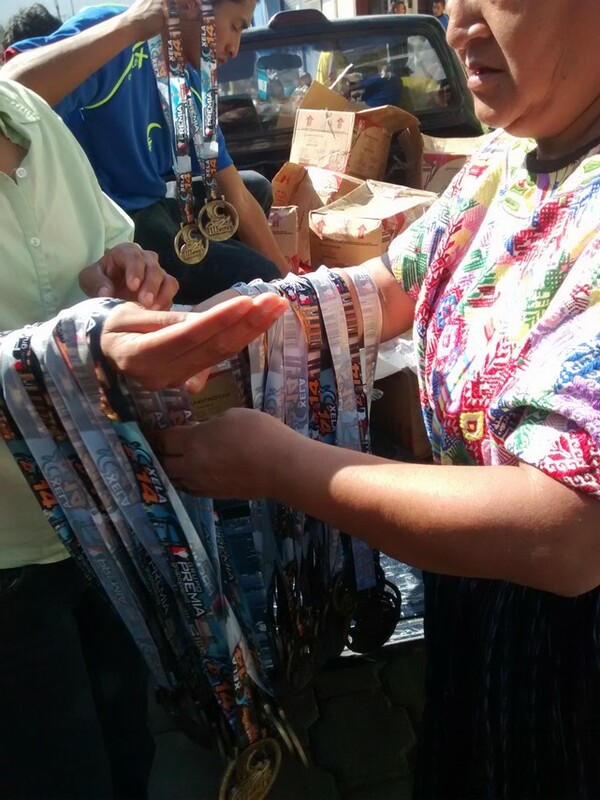 Race medals being prepped for distribution to runners. Note the woman's traditional Mayan traje. Also very common throughout the country. Medals being presented around the neck of each runner. All in all this was a great race. Sure there are things to improve on like details on the website or food at the end but heck, for $17 this was a steal. 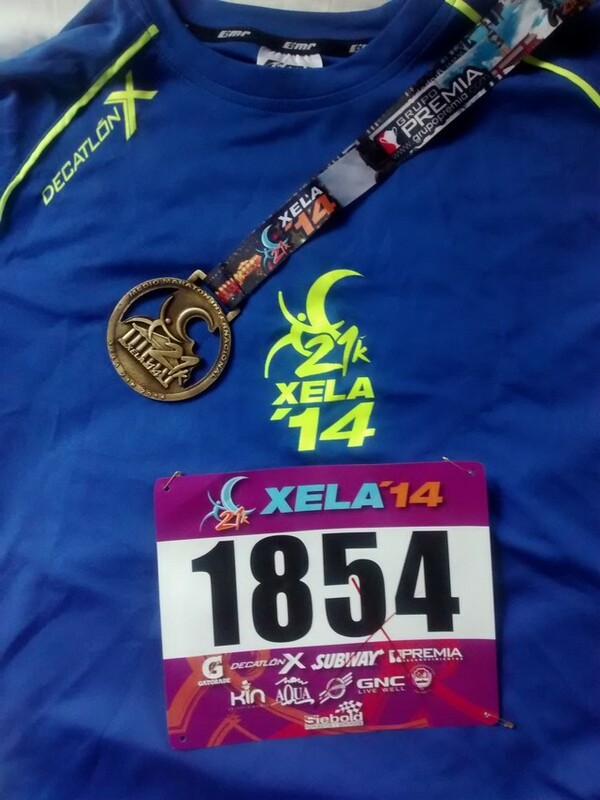 My tech shirt, bib and finishers medal. As for my personal performance, I did pretty well sticking to the 8 minute mile goal. I finished in 1:46:32 which is 8:07/mile. I can live with that and will look to beat it in my next race! Race results were texted (for FREE) to each runner that asked for them.